Ahhh… the warm tonal attributes, those faint pops and crackles, the life-sized artwork, just the act of setting needle to groove, they all bring to mind an immersive experience of days gone by. Although advances in audio technology may bring about improved sound quality, they also result in a new set of difficulties that music enthusiasts must overcome. With the appearance of compact discs (CD’s) in the early 1980’s, the production of vinyl records began its decline. Compact discs were not nearly as susceptible to degradation from repeated playback, dust and scratches. And as digital audio reproduction improved, the CD with its greater storage capacity, physical durability, and general portability, quickly became the preferred format, leaving vinyl records to slowly fade away. The number of recordings that ceased to exist with the declining popularity of vinyl is huge. For some audiophiles, this presents a very real problem; because of the inherently fragile form of vinyl records, as well as the slight degeneration of sound quality that comes with every listen, not to mention the fact that many simply can not be replaced, owners of these relics often leave them unplayed for years at a time, collecting dust, and relying on nostalgia to fill the void. But just as the compact disc was largely responsible for the demise of vinyl, it is this same medium that can help resurrect and preserve these analog veterans from deterioration and obscurity. Let’s look at several techniques for copying vinyl records to CD format. There are a few all-in-one or combination systems that make it relatively easy to transfer your vinyl recordings to compact disc. The Teac GF-350 Turntable CD Recorder Player (about US$250) offers simplicity, while the Audio Technica AT-LP2D-USB LP-to-Digital Recording System (about US$200) provides a kit to help you create CDs or MP3 files from vinyl recordings. Chances are, though, you already have the necessary hardware to breathe new life into your old records. Nearly every household has a computer with a writable CD drive (CD burner) that will accept CD-R (record-once) or CD-RW (rewritable) media. If you don’t have a CD burner, external CD-R/RW drives that connect with USB or Firewire cables are readily available, priced at US$30 and up. Of course, a record player is also required. Thanks to the popularity of hip-hop and electronic music DJ cultures, there still remains a niche market for the production of turntables with both consumer and professional use in mind. Most lack built-in amplification, so a stereo amp or receiver is required to boost the signal from the player to the computer. 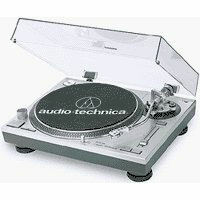 If you need a turntable or receiver, you can find them at most large electronics stores, starting at around US $100. Most turntables have a pair of red and white RCA output jacks, often accompanied by a grounding terminal. Connect the color-coded outputs from the turntable to the corresponding inputs on the stereo receiver using a stereo RCA cable, ideally one that includes a third wire with U-shaped connectors that can be secured to grounding terminal screws on each component. 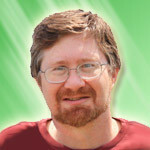 Your stereo receiver should include a pair of main or auxiliary outputs, which need to be connected to your computer via either a stereo RCA or RCA to 1/8-inch cable, depending upon the inputs of your computer’s audio card. NOTE: All of the techniques above apply equally well for transferring cassette tapes to CDs. Just substitute your cassette player for the turntable. If your cassette player does not have RCA-style audio outputs, use a 1/8-inch to RCA cable shown above. Bob Rankin bob rankin, cable, compact discs cd, computer, digital audio reproduction, dust and scratches, music, player, receiver, sized artwork. permalink. To The Kid,Wait till the first time your setup craps out. CDs can be played on PCs, CD players, CD recorders and are portable. 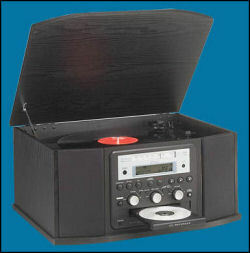 Heartland America catalog has record players with usb or built in CD recorders at reduced prices. SAw one in Staples last week.. about $150. Walmart is now selling record player with direct USB connector. Probably others out there as well. Vinyl to CD? Are you kidding me? My CD collection has been gathering dust for several years now. If I want to hear one of my old LPs, it gets recorded in Audacity as a WAV file, normalized, sliced into tracks, then imported into iTunes. Wake up, go green, stop using CDs. I connected my stereo to the pc via the earphone socket of the sterio, it removes most imperfections on very old records and cassettes. Thanks for the information — I have looked for solutions to convert vinyl to CD’s without buying another piece of hardware. I have a Sony CD Recorder run in line with my receiver and can record any media to a CD. I Love it!